February 2002 Attempt; Leo Houlding, Alan Mullin & I traveled to Argentina intent on lifting the veil of controversy shrouding Cerro Torre's first ascent. 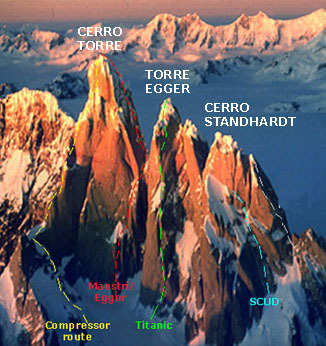 Cesare Maestri's claim to Cerro Torre's North face & summit has been the source of never ending controversy. If the Italian Maestri and Austrian Toni Egger did achieve the Torre's summit, this stands as the most radical ascent of the century. Route History; The story is thus: Maestri & Toni Egger climbed the crack systems (photo) to the right side of the snow patch (lower E face) then tangented rightwards to the Col of Conquest via a crack and ramp-line. The actual North Face he reported to have been entirely ice coated, allowing easier passage with the crux being a section before the col. A party climbed Torre Egger accessing the col in a similar fashion, some ropes and pieces were discovered but just below the col. Pitches directly beneath the col proved technically easy via a hidden ramp: Contrary to the Italian’s tale. Maestri stumbled alone from the base of his claim with Toni Egger having been swept by avalanche. The ice glazed upper section was claimed prior to the use of twin ice axes; one shoddy long handled axe and a dagger was the era’s mode. True evidence, Maestri says, is in a drilled rappel route down the left (East) side of the North face plus occasional belay bolts en route. The face has seen few attempts with only one team making serious progress beyond the col. None have found evidence of bolts and none have succeeded on one of the ultimate Alpine prizes. Maestri's first expedition to the region ended when the leader finally saw their objective (Cerro Torre) shed its cloud; he immediately dismissed any possibility of the climb. The next season, '59, saw Maestri & Tony Egger back in the region intent on the peak. Previous recon had Maestri favoring the rock on the North side instead of the iced West face that had been spied & tried earlier the same season by fellow Italian and rival, Walter Bonatti. Rock was more akin to his home Dolomite style than the favored mixed line of the Western Alp practitioners. 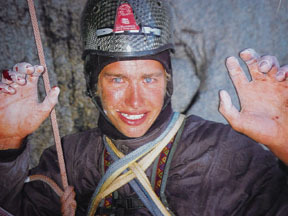 Toni Egger was recruited for ice and mixed climbing skills & the original third partner Cesarino Fava opted out after reaching the Col of Conquest. Fava later met Maestri stumbling alone away from the route's base. Fava, ex-pat Italian and Argentine resident was responsible for initially sparking the ascent by sending Maestri a photograph. On returning to Italy after claiming the ascent a hero's welcome was received but before long doubt started to fly. Several Italian rivals and other acclaimed climbers began to voice and publish doubts. To this day there is no resolution; Mark Synnott interviewed Maestri for Climbing Magazine (May '99) and came away without new knowledge. Common belief is that the summit via the North face has not been climbed. It would be ironic for the most difficult line on the Torre to be its first ascent. I follow many in thinking an ascent would be a first. Specially after having been on the route: The claim of climbing to the col in one day seems a little far fetched, it’s sustained technical granite that would be no easier if ice coated? Our alpine style attempt utilized the three-man caterpillar style. One-person leads a block of pitches, another cleans & the third jumars a free line. I believe three people to be faster and more efficient for technically sustained routes. Short fixing (two man speed style) is quick for routes that are entirely free and less technical, for an unknown quantity such as this choice three grants less of a workload & allows more food, warm clothes (no real bivi gear) and resulting security. The system was perfect and all flowed smoothly until Leo snapped a foot hold on the last pitch of his block, he hit a small ledge, even yelled "Sprained ankle" before weighting the rope; later diagnosed broken. Descent went surprisingly smoothly and continued on the glacier. We arrived in Norwegian camp (high camp) around one am, bivied, continuing to basecamp the following day. Leo crawled down the initial scree & talus to the main glacier at which point I piggybacked him the remaining distance (with help from a Russian pair). A stretcher crew met us after the final glacier, perfect timing for the remaining undulating miles to basecamp. Another bivi then horseback finished his journey to El Chalten. First x-rays were inconclusive resulting in an ambulance ride to the larger town of Calafate. Further consultation in Chile left Leo with an air-cast, travelling to Britain for a conclusive prognosis. The tailus bone was shattered requiring a graft from his hip to re-construct. A 90% recovery was predicted, the worst-case scenario being an improper recovery of the blood supply, requiring the joint to be fused. His psyche is intact and healing is going well. A 100% recovery achieved! After Leo’s exit we enlisted Johnny Copp (from CO). He stayed ten days before being broken by a return to normal climatic conditions, incessant bad weather. Understandable, we’d persuaded him to extend an already successful trip, seven weeks with two new routes. The white wall hovering over the peaks didn't abate, no more climbing days granted. Cerro Torre only reappeared for a couple of hours. There was a lot of fixed rope on the Maestri/Egger, new black static with fresh Mammut wire gate biners? Probably from last winter's venture? Fixed ropes? Someone's straying from the path: isn't Alpine style the way?